right information to assess pathological conditions. This package only includes the Quantum CARE, Large Cup (1 liter), Large Plate (30 cm x 30 cm), CARE C11 Software. Operates on 110 to 250 volts A.C at 35 watts. This package only includes the Quantum CARE +, Large Cup (1 liter), Large Plate (30 cm x 30 cm), CARE C11 Software. Technology that enables you to measure and analyze any energetic-imbalances in order to treat your personal quantum field and reestablish your health by using the right information to assess pathological conditions. 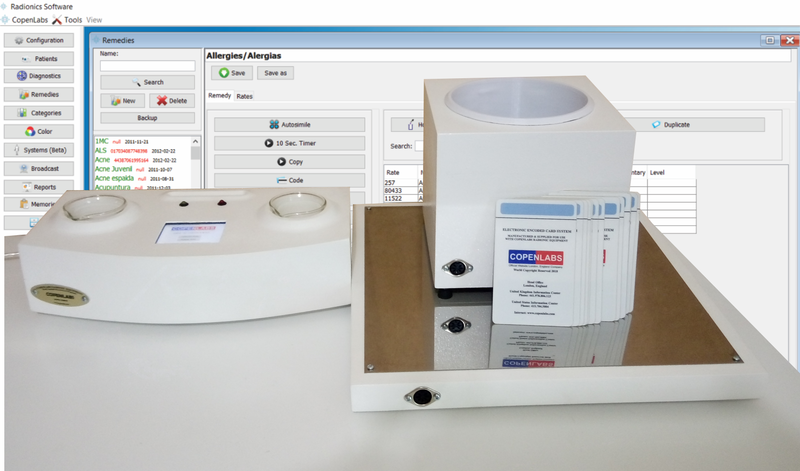 This package only includes the CARE ND, Large Cup (1 liter), Large Plate (30 cm x 30 cm), CARE C11 Software. The Potentiser has two ranges - The X Range (Decimal) and C Range (Centesimal) from number 1 potency upwards to 1m. 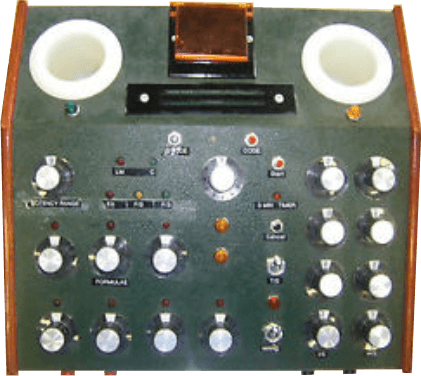 This is a replica of the Mark 1 instrument, the only difference being that there are 15 main Rates, Dials, which are also multiplied six times for research purposes, and this gives considerable scope to the sincere worker. 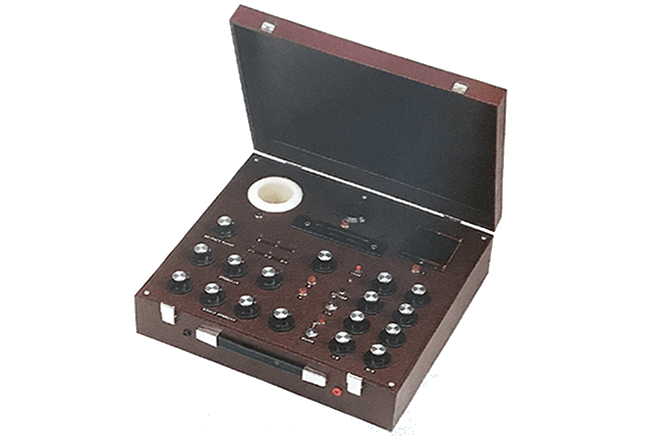 This instrument may be termed the ultimate research tool in radionics, and thus will enable the operator to reach in to the unknown to obtain factual information and to use it for the benefit of mankind in the best possible way. Photograph of the computer shows it on edge in order to display its essential features, but it is, of course used flat open on a table. A new style MK2 computer for diagnosis, treatment, with built-in potentiser. 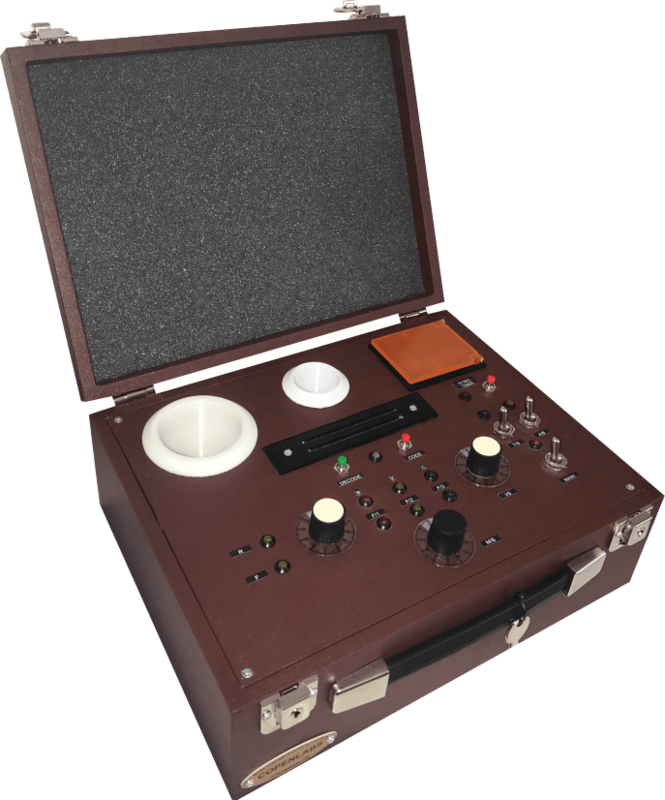 This is a new and improved version of our traditional MK2 unit which offers the same facilities in every way, but has a 'stick detector' pad for professional use (a pendulum can also be used if required). Colour of case as illustrated, but may be ordered in Black, Green and Blue. Size: Closed 13(1/8) in. by 15 inches. by 15 inches. by 5(1/4) inches - 33 cm x 38cm x 13cm. 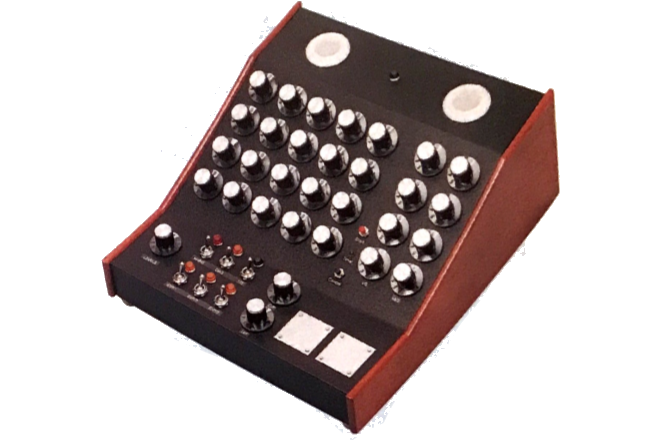 The MK7 Radionic Computer operates in much the same way as the original MK2. It has 20 dials rates setting, which will enhance further research for the sincere worker in this interesting field.. along with a 12 level diagnostic system from the lowest to the very highest aspirations, both for testing and for diagnosis and treatment. The normal OVER and UNDER function dials. PLUS a medicine potentising system from 1 x 100mm equal to the range in the model CC/80.. a transfer system is already built-in so that exact copies of medicines can be made. A feature is the very fast 10 seconds system of potentising which cannot be found elsewhere. The instrument is a new style cabinet, rexine covered, with solid Mahogany sides, and it come with all the usual literature, rates books, cables and plugs. Size: 34cm x 13cm (height at back) and 5cm (height at front). Total weight is 3.5 Kilogrammes. A version of the already described model MK/7/6/MY, but operated by the traditional stick pad detector. May also be used with the pendulum if desired. The unit will diagnose.. analyse.. manufacture potentised medicines from 1 x to 100mm plus the new higher potencies named as F/1, F/2 and F/3. 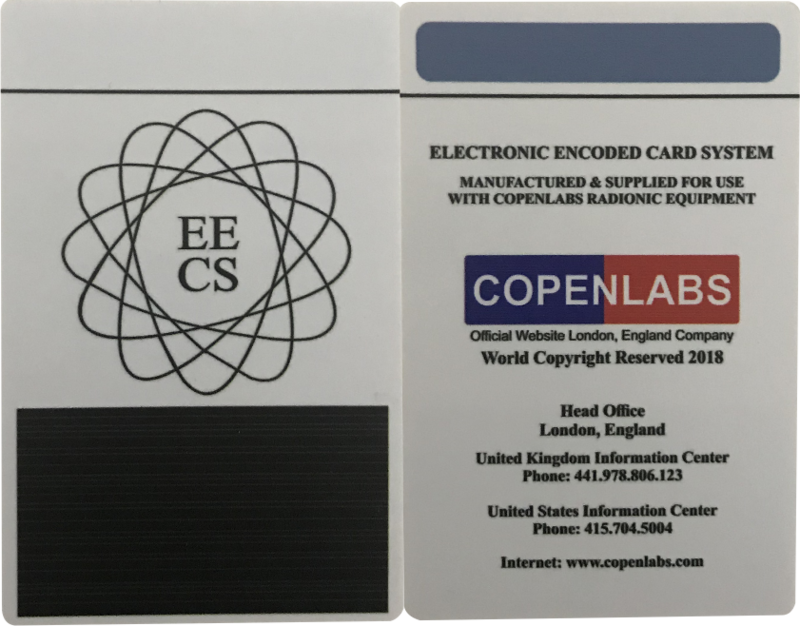 Incorporated also is the EECS System, by which the encoded cards can be encoded, de-coded or used as a diagnostic or manufacturing tool. Size: 34cm x 13cm (height at back) and 5cm (height at front), Weight: 3.5 Kilogrammes. Complete with all rate books, instruction books, cables, etc. plus a supply of blank uncoded cards, and packing case. 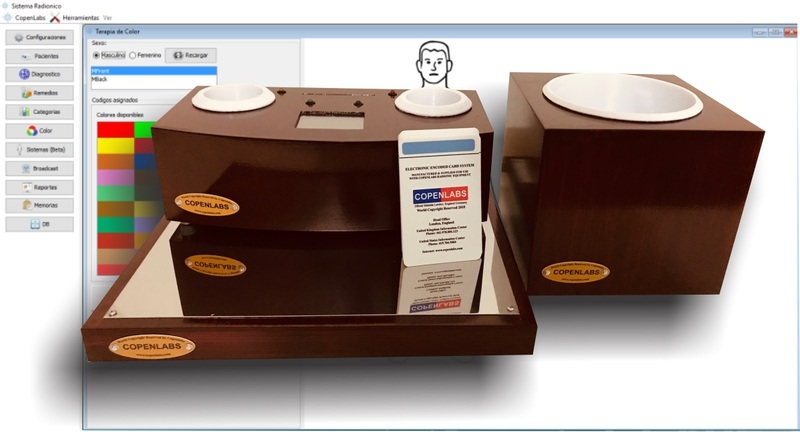 This is a new version of the Radionic Computer in a closed cabinet with a removeable lid - this enables the user to carry it to site of operation - with the easy removable/replaceable lid, thus keeping dust out, and affording easy access to operation. The operation and instructions are exactly the same in every respect as the earlier MK12. A slight variation of the position of the signal indicators and switches will be seen in the image. Standard colour of case is Maroon or Red Wine, but is available in the other standard colours on request. Standard in this unit is the 12 level diagnostic structure, and a 5 minutes timing/manufacturing sequence. Supplied with all cables, data sheets, instructions, EECS cards, all complete. Size: (with lid closed) 38cm x 34cm x 12cm. 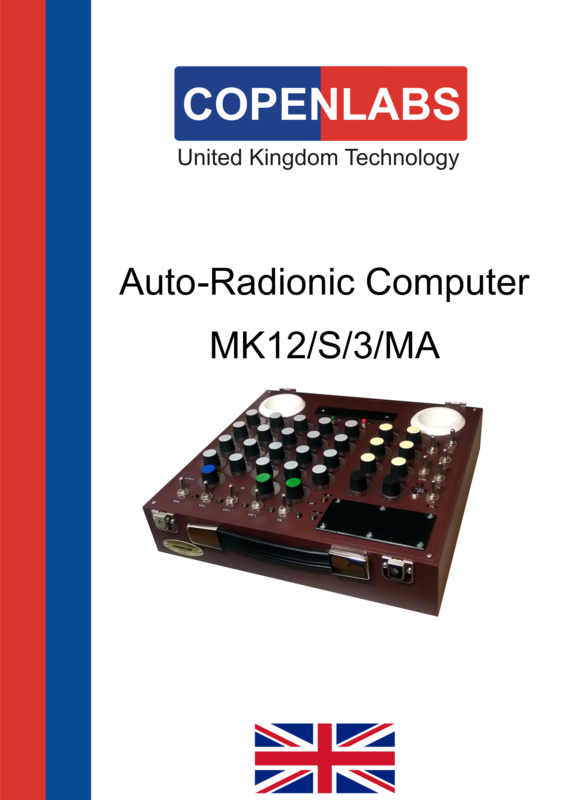 This is an extended facet of the MK12 auto Radionic Computer offering a combination Electronic Potentiser, and Radionic Broadcaster to the Practitioner requiring extreme portability, with removable lid. The unit incorporates Large left hand(receiver) cup. a switchable auto selector section. An EECS card encoder/de-coder, with a 10 second manufacturing system. Potencies from B - X - C and F1 - F2 - F3 ranges. a simplified remedy transfer method-similar to the MK12. 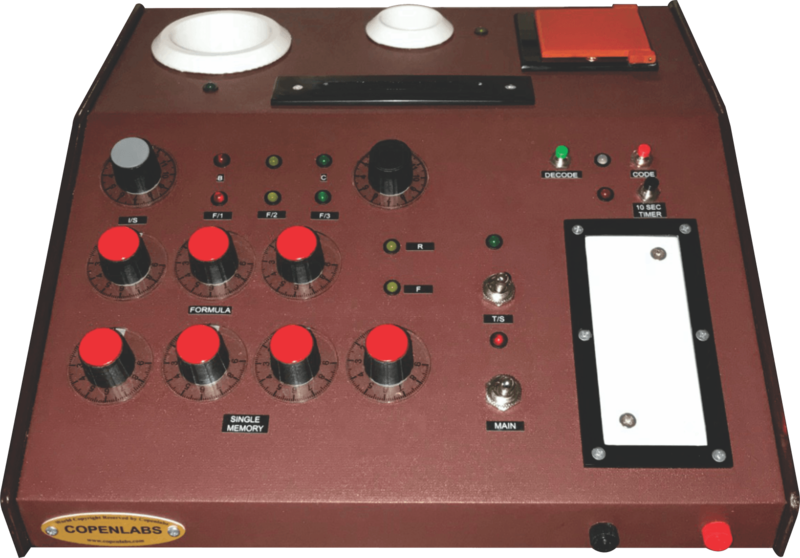 Radionic Broadcasting/treatment is utilised by a switch. Size 31cm x 24cm x 12cm (with removable lid) net weight approx 2.5 kilos. 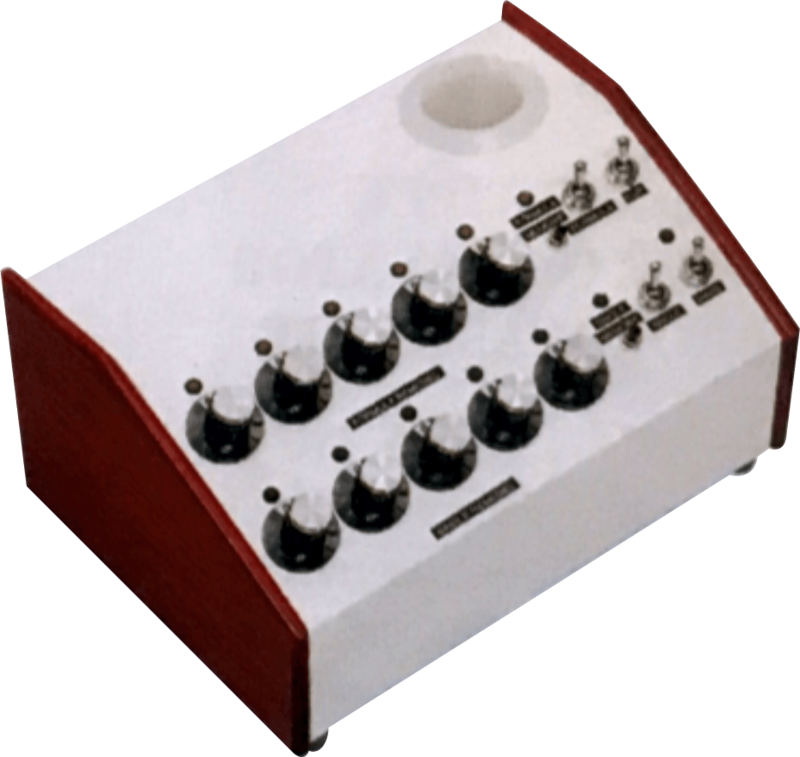 This model of the well-known potentiser solves the problem that many of our users have had for years, namely, to make a mixture of up to 4 remedies in the single media, in a wide range of potencies with an option of making 1,2,4 or 8 ounce quantities with plug accessories. The instrument has been in continual service for a number of years with success among many practitioners the world over. 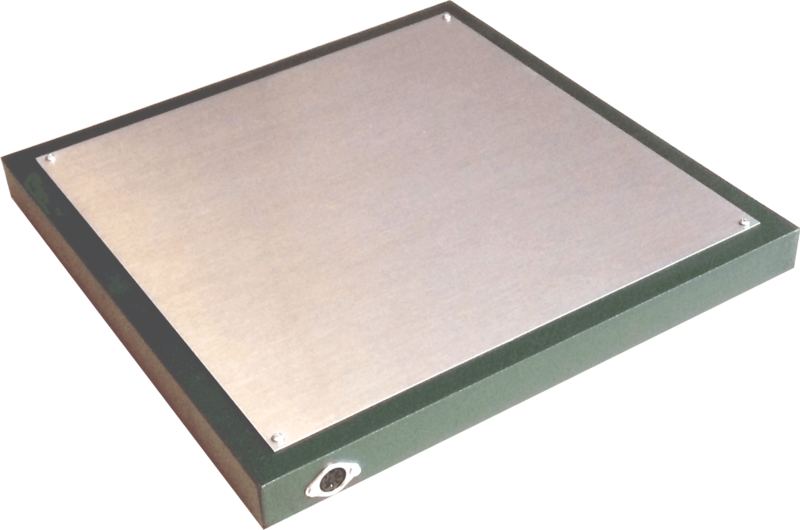 Its scale is from 1x upwards in numerical sequence to 100MM, which is usually far above the requirements of the average user. A special introduction booklet of instructions is available which will give more data. 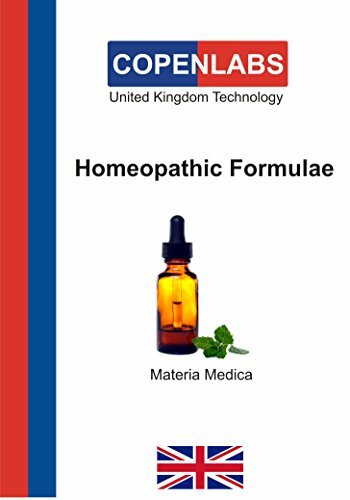 The instrument is also shown in the Potentiser Handbook, and in the Materia Medica of Homoeopathic Formulaes. Fitted with 10 second timer system. As usual it is in a wood cabinet, leatherette covered, with chrome plated fittings and black ebonite dials with white figuring. This is an improved model of the well tried and tested potentiser range, which we have invented, designed and manufactured for many years. This unit is enclosed in a matching style cabinet to the MK12 Computer. This EVP incorporates the facility to manufactured from 1 to 8 remedies in one mixture, in any potency from 1x to 100mm (higher ranges made to special order). The unit incorporates the essential features of the Auto-therapy Potentiser... and has a choice of built-in two sizes of cups, which way be used singly or together to enhance the amount of medicine manufactured. The new system can make any medicine in the short time of 10 seconds, this saving valuable working time. The Cabinet comes covered in rexine, with polished Mahogany sides, and comes with all cables, plugs, literature rates books, etc. Additional extra or variations: 5 minute timer system, Large Cups units. Size: 35cm x 38cm (height at back) and 4cm (height at front). Total weight is 3.8 Kilogrammes. This unit is a newly designed and improved system of making copies of any type of potentised or crude substances. The system has been used for many years, and it is based on method of early pioneers such as Drs. Duncan, Eeman and Powell etc. The Unit will make up to 3 ounces of a remedy (about 250 gr) by the transfer system... invented by our laboratories. The potency range is vast and includes 1 x to 100mm PLUS new ranges described as F ranges, and give very high frequencies for sensitive patients. The substance to be copied is placed in the right hand cup - and copied into the left hand cup. The unit has ability to accept Large Cup unit for larger quantities. 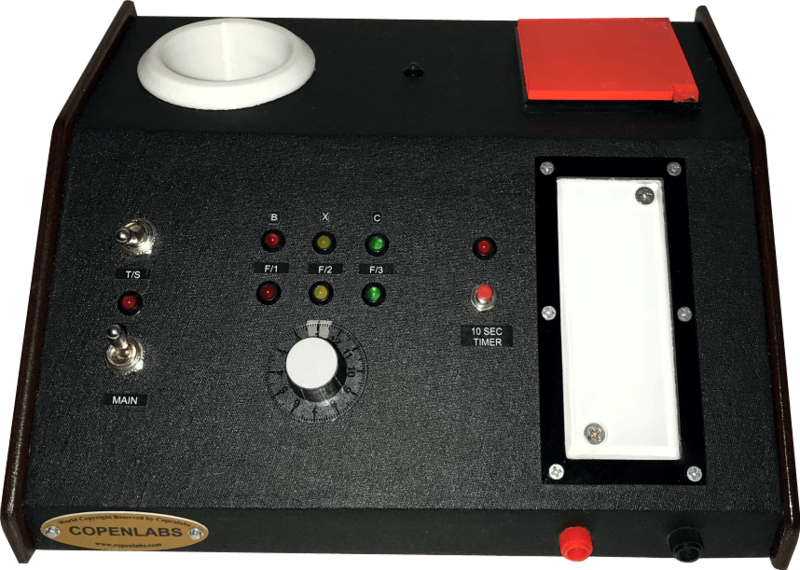 The instrument comes complete as shown with cables and full working descriptive literature, it requires no technical knowledge to operate - on any voltage from 110-250 AC. A 10 seconds timer is incorporated to enable the operator to leave the instrument to operate in an automatic manner. Size: 30cm wide x 21cm (from to back) and 13cm high. Total weight is 2.0 Kilogrammes. 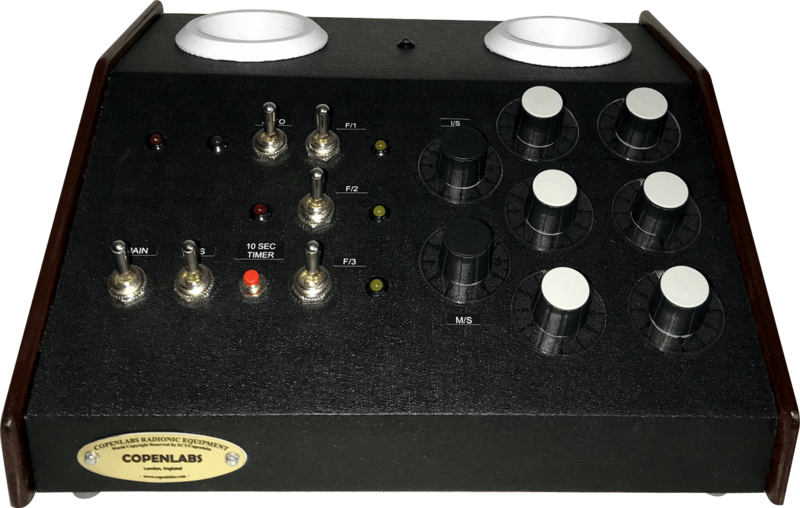 The Automatic Selector Potentiser is the very first unit of its kind in the world and is totally automatic in its selection of remedy frequency and potency selection. The instrument is operated by a newly invented (by our laboratories) Laser activated Solitron wave technology. It is simple and easy to use. It may be used in 2 ways: place blood sample under clamp.. switch on.. and in seconds the remedy frequency is selected, all you have to do is to turn knob to potency level... marked as B - basic, X, C, and F/1 F/2 and F/3, and F/3, then press the timer start button... the remedy is manufactured automatically once the neutral substance is placed in the cup. Size: 29cm wide x 20cm front to rear x 12cm high. Operates on a switchable 110-250 Volt AC. Weight: 1.5 Kg. Outlet at rear for L/Cup attachment. Using the realible Laser-Solitron in this series of Potentisers, this model is identical in every way to the model ASL/90/9F but has the additional scope of using the Electronic Encoded Card System, in order that any remedy, formular or specimen of a patient may be recorded onto the card, and stored - and re-used - many times over. The unit is supplied with un-coded cards. The ASL units can, in the future, be added to by means of a multi-socket at the rear. 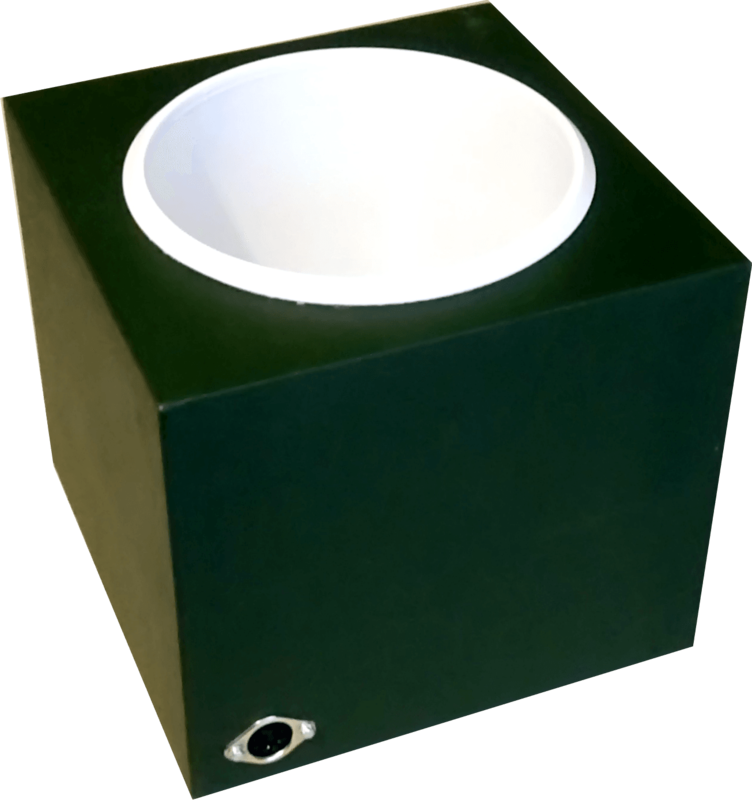 An additional single large cup unit can also be used if required. Size and weight is the same as other models. The great advantage of this model is that it still offers the automatic features, but has a manual override also, giving the Practitioner complete control of the remedy manufacture - which is still only 10 seconds. This is the most modern and up-to-date unit of the series, offering all the features of the basic unit ASL/89/7F to enable the operator to Copy - find the Similimum - formulae etc... but also it has the manual system of selecting the potency, as well as the programmed. The Manual selection of potentising is shown on the right side of the cabinet (8 dials) and the range extends to the normal range from 1x-100mm. The unit shown is the most modern one of its kind, using the proven - Solitron/Laser technique for manufacture of Homoeopathics, Copying and EECS System for storing data. It is simple and easy to use. It may be used in 2 ways: place blood sample under clamp.. switch on.. and in seconds the remedy frequency selected, all you have to do is turn knob to potency level.. marked as B - basic, X, C and F/1 F/2 and F/3, then press the timer start button.. the remedy is manufactured automatically once the neutral substance is placed in the cup. OR you can select potency level by using the 'stick detector pad'. The two front outlets shown in the image can be used for clinical direct treatment by hand-electrodes. The unit has a socket in the rear for fixing a single large cup unit, by which cup to half kilo (1 lb) may be made. Total weight of the unit is 1.8 kilos (or 3 lbs) unpacked. This instrument can operate with 110 - 250 volt. A.C. 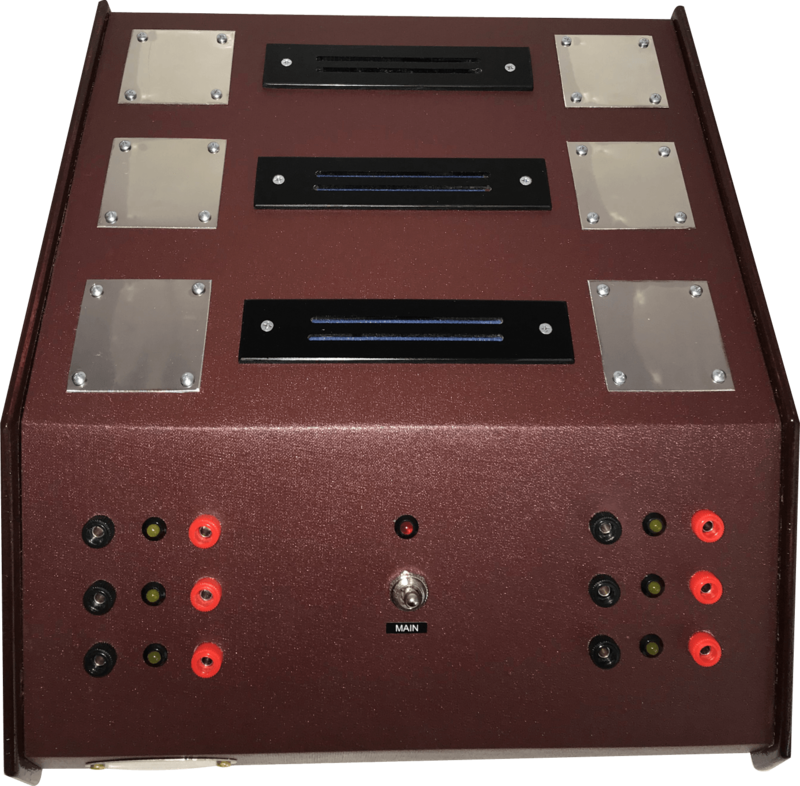 This is the version of the Auto Potentiser model ASL/90/9F but is now available in a closed cabinet with a removeable lid - thus enabling the user to use its portability to the full. The operations and instructions are exactly the same in every respect as the earlier model. A standard 10 seconds timing sequence is standard fitting. Size: with lid closed, with carrying handle 38cm x 34cm x 12cm. Supplied with all data sheets, instructions, cables and EECS Cards, complete. It will programme.. single or multiple remedies into the units. It is the most modern piece of equipment made and will give many years of service. Dimensions and weight similar to the MK12 Computer. Normal colour Black, with chrome fittings, solid polished mahogany sides. This new unit is a comprehensive improvement on the previous ASLD/90/PR1. It has the same dimensions, weight and general operation.. but with many added multi-functions, such as... Larger remedy receiver cup on the left hand side. Auto (LASER-SOLITRON) system. New solid state reaction stick pad.. for use in analysis with 'stick' or pendulum use. Standard 10 second timing system. New diagnostic switching to simplify operation. Multi memory for storage of remedies in singles or formulas, either on EECS cards or more permanent mode. Addition sockets in rear for up to Four additional large cup units. Colour: Wine-Red, but others available. Complete with all instructions, including books and data sheets, cables and EECS Cards. For many years we have been producing instruments which help the more Sensitive Person to overcome a good deal of harmful types of radiation, either from aggravated background, the earth, or man-made radiation, such as fall-out, electromagnetic, x-ray etc. The unit requires no technical knowledge to operate, and has a selector system which will take into consideration individual circumstances, wherever you may be. The unit is fully automatic in operation, each unit can cover an area of 6 square metres around and above itself. Size: 30 cm x 16 cm x 6 cm (height) with sloping front. Covered in Rexine with solid polished Mahogany sides. 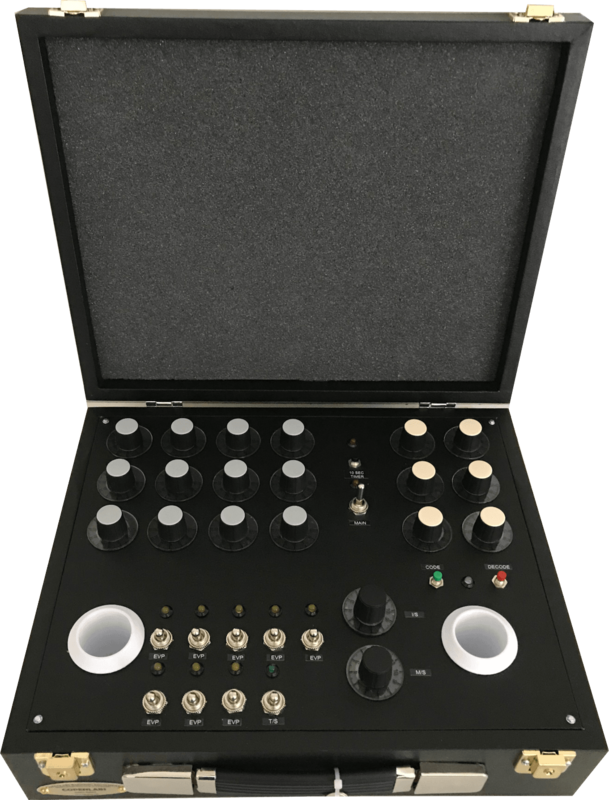 The Auto-Radionic broadcaster is a new concept of distance treatment with very positive results - using pre-coded treatment cards, thus avoiding the use of settings rate dials. The units give treatment on all levels. Unit A has a two-card activated broadcaster, which may be used for 1 or 2 patients. Unit B has a six-card activated broadcaster for up to 6 patients. Cards can be pre-programmed on any Card activated radionic computer or ASL unit. This is a most compact unit - total weight only 2 Kg. Operation is very simple and needs no technical knowledge. Simple instructions for this unit are supplied.. but not supplied with EECS cards - these can be supplied pre-programmed to your required rates - or supplied pre-coded from our supply. Size: 30cm x 16cm x 6cm with sloping front as in photograph. 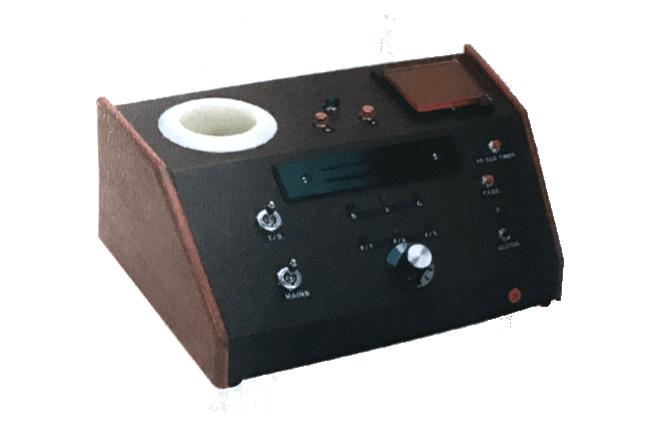 In order to make it possible to achieve permanent storage of radionic information and thus to simplify therapy -as long ago as 1987, Bruce Copen Laboratories introduced a new technology in the field of radionics and electronic homoeopathy: the EECS Electronic Encoded Card System. 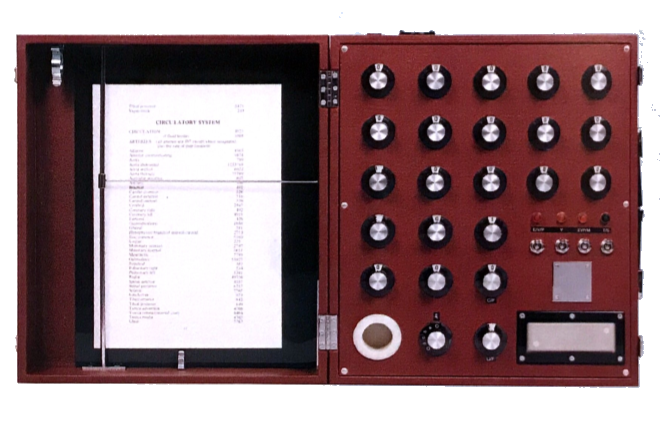 On an EECS card, in much the same way as on a computer diskette, you can store all information employed in radionics. This information can be the data for a patient specimen, data for a complex homoeopathic remedy or a balancing program. On one card, you can store up to a maximum of 15 different remedies or rates and cancel them at any time. The storage process takes no more than 3 seconds. Cards can be processed in all Copen instruments with EECS and also interchanged between instruments. The EECS Broadcasters (above) enable a simple form of radionic therapy which can be used by anyone. In daily practice, the EECS represents a considerable time-saving and you will soon find it indispensible. 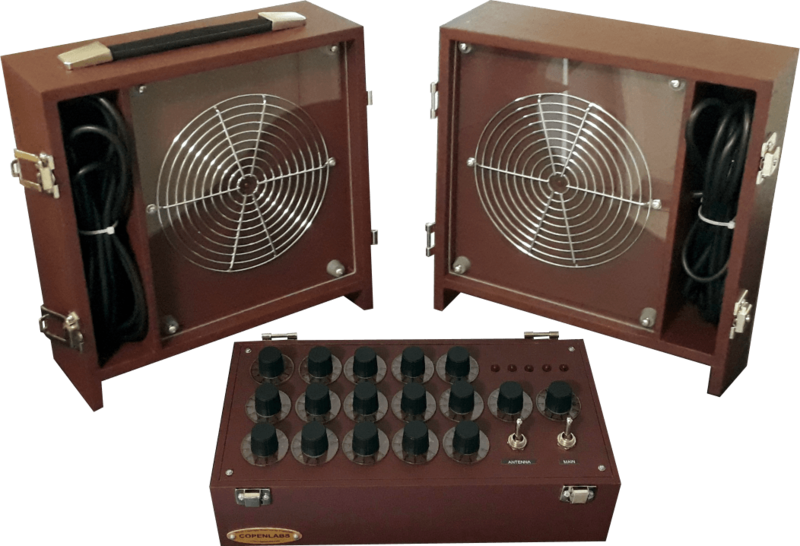 The Multiple Wave Oscillator it consists of two instruments, the Generator and the Resonator. The Generator is the larger of the two, since it produces the activation of the circuits on a great variation of frequencies, the power of which is controlled by a single dial. 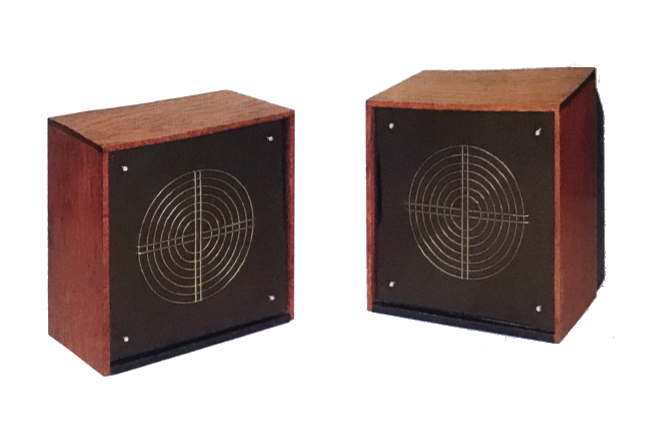 The Resonator, being a slightly smaller unit, is connected by a cable, and its purpose is to 'resonate' or oscillate in unison with the frequencies produced by the generator. The resultant forced field passed through any living tissue and reactivates the cell structure to a healthy vibration. 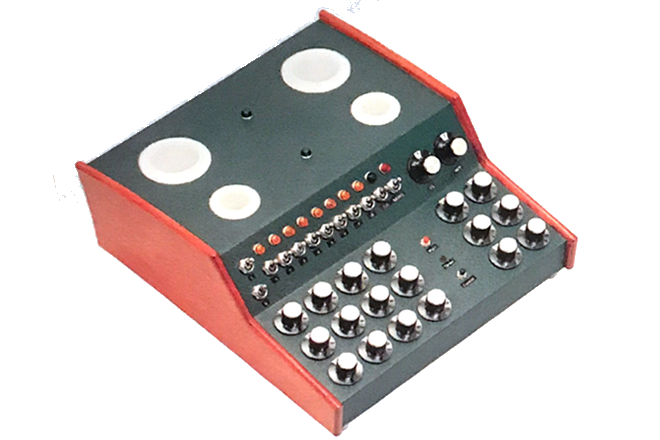 This is a special model made to order for the practitioner who requires to use the instrument for the treatment of the higher frequencies as in the radionic computers. 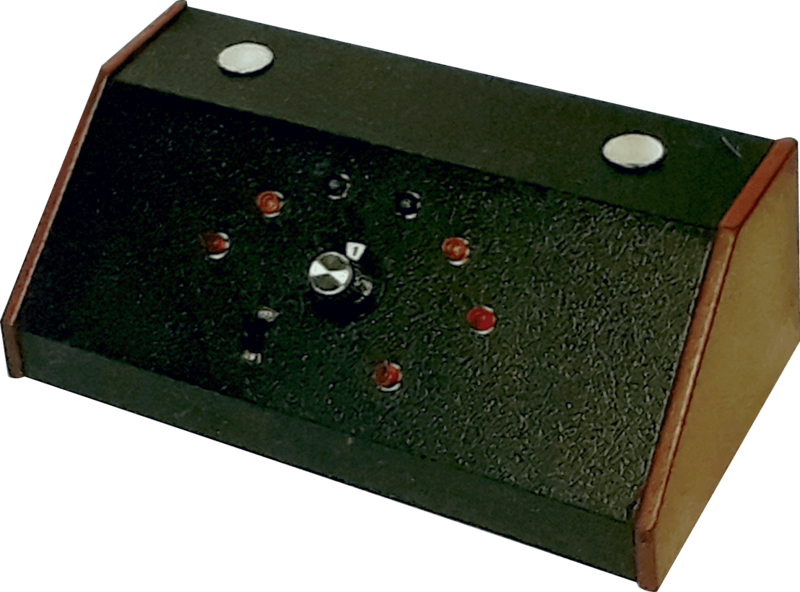 A system of switching increases the capacity of the oscillator to radiate the treatment for the mental auric and spiritual fields. 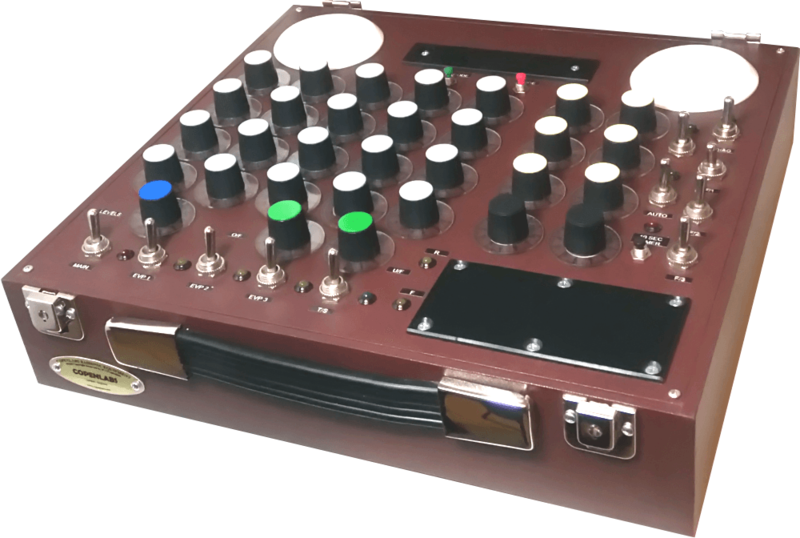 This is a new style Portable Multiple Wave Oscillator, shown in the open position. It has same operating instructions and power as the standard unit. The two units show the Generator & Resonator, while the bottom section contains Rates dials, and controls. Supplied complete, case coloured marron, but available in Black at no additional cost. 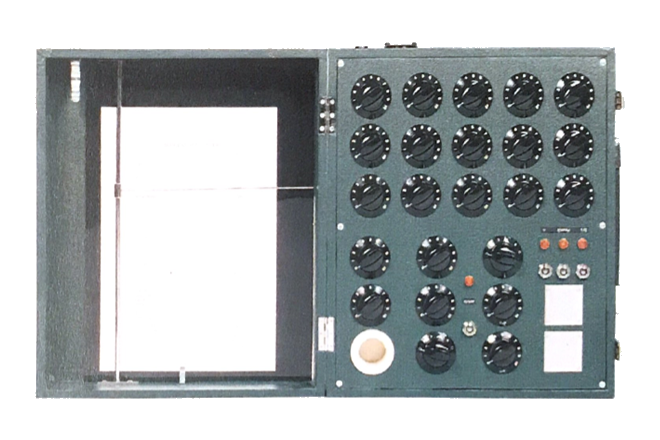 This unit is designed to be linked to the Auto Radionic Computer of the MK12 and MK7 Range and is applicable for linking to past MK12 Instruments to the MK12 Units from 1992 period. This unit is capable of storage into memory from the master unit, up to 9999 Single remedies, and 9999 Formulae remedies and its retrieval to the MK12 to manufacture any stored remedy in any potency. 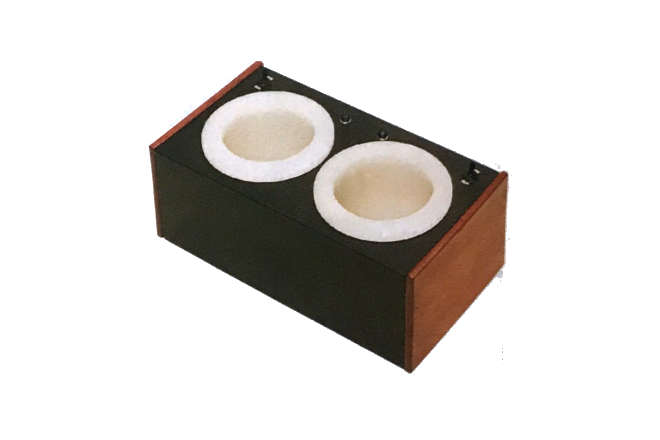 This is larger Single Cup unit for use with our CC/80 Potentiser series, and with the Autotherapy potentiser. This unit may be manufactured for connection to any other EVP in the range. Model L/CUP/A with one outlet for some others in the CC/80 series, incluiding cable. The twin cup attachment shown in the photograph is designed to make a perfect match for the EVP CC/86/8/APS and most other units, and will manufacturer up to 1 kg of medicine at any one time. Either or both cups may be used at the same time, also the normal cups in the mother instrument as well. Linked by a single multi flex cable to each large cup, it activates the built-in time activator and will provide the fast time of 5 minutes and quantity of remedy desired. Size: 35cm x 13cm x 13cm (height). 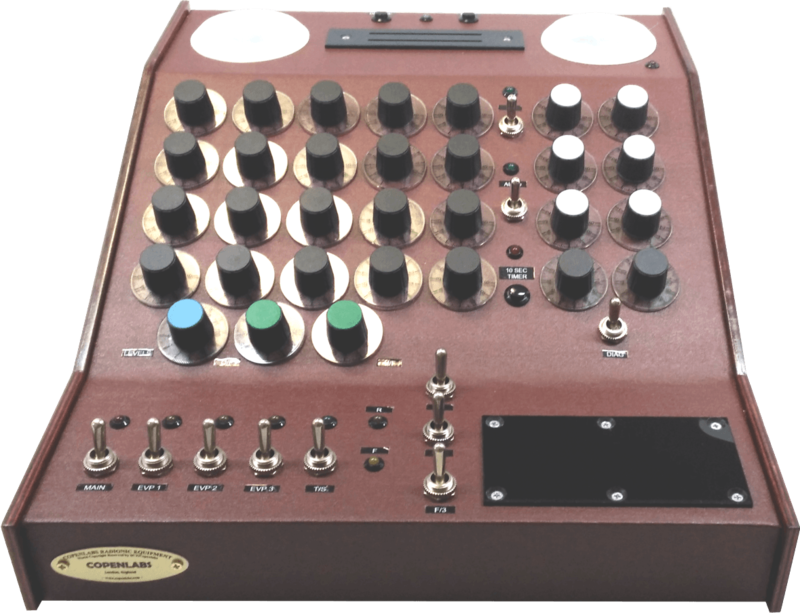 It is possible to develop large-scale remedies and other alternative radionics processes. 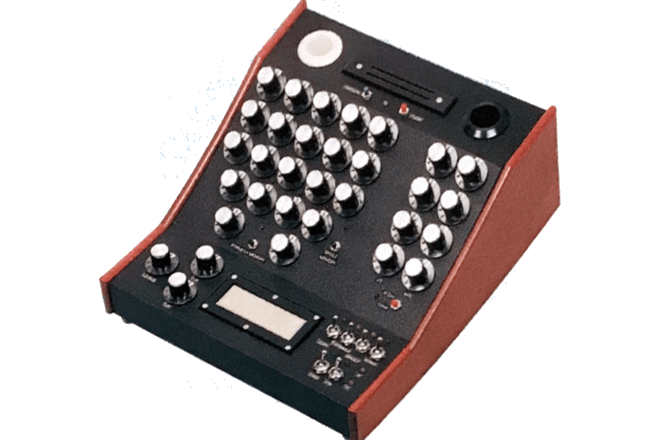 It can work with all MK instruments, ASLD and EVP. 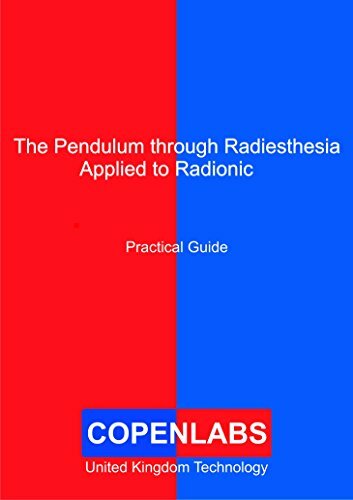 Precisely the purpose of this text is to provide essential principles of practice and elementary knowledge so that every person who yearns to develop him or herself within the field of radionics has the necessary tools to be successful and thus their intuition grows. Despite the infinite possible measurements that can be carried out with the pendulum, with practice and mastering of a few basic skills, which must necessarily be developed, it will be possible to find what the conscious mind seeks in the unconscious. 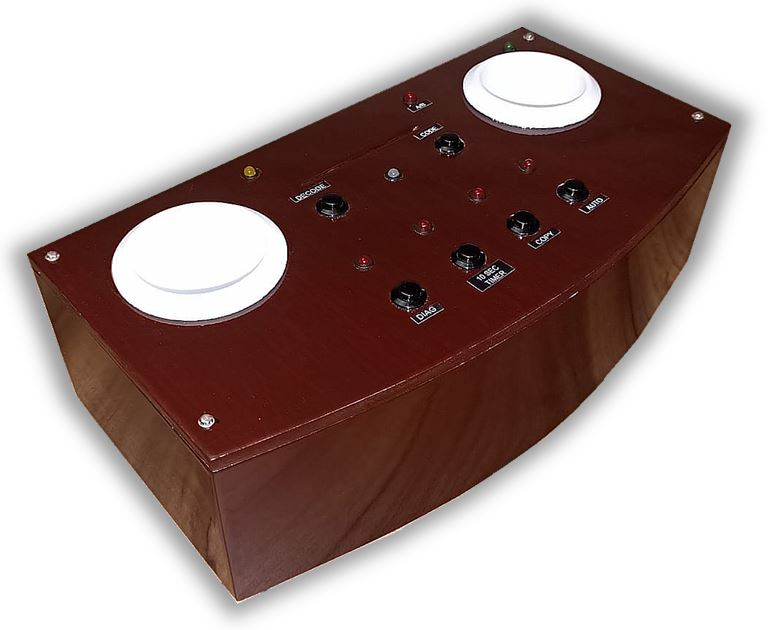 The important thing is to be constant, focus and maintain the serene concentration and seriousness of attitude that the process of radionics deserves. 1.Title or name of the remedy. 2.Description of what symptoms to look when using that remedy. 3.Remedy is the name of the Encoded component, and Potency is how it will be potentized, that is the Value (4) and the Dynamization Method (X). 4.It is a description of what symptoms the Remedy it is related to. 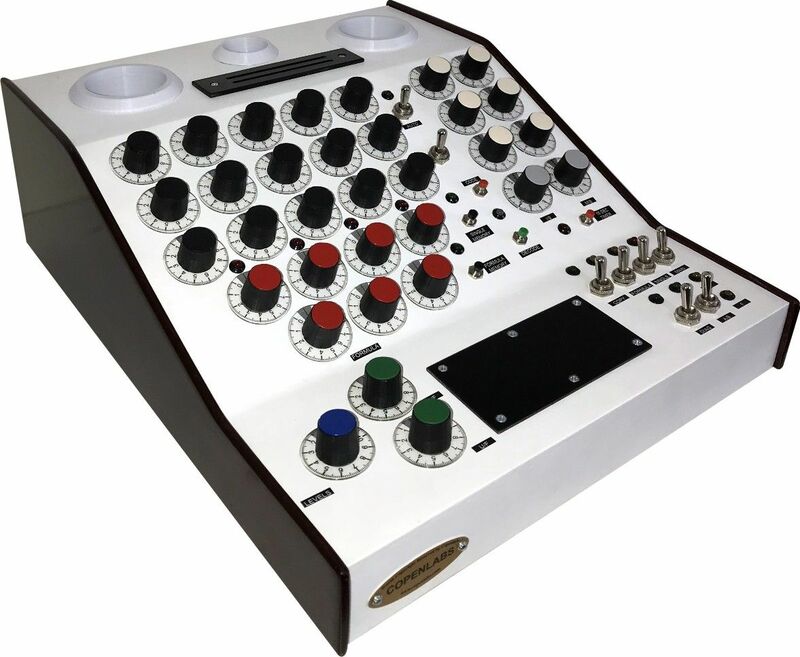 This instrument has a number of advanced features by which a many operations will bring time-saving and accuracy; it is one of the most modern pieces of equipment of its kind in electronic medicine. The following features show its basic operations. Some features are: Diagnostic Features, Broadcasting, Homoeopathic Copying, and more..